Yes. I’ve had the Apache RR 310 for nine months now and no, I haven't been really able to clock enough miles on the bike. And that called for a road trip. After selecting Goa as the destination, I had a 1,000km road trip with plenty of highway riding and around 100km of cutting through switchbacks ahead of me. As luck would have it, my colleague Dhruv joined me for the trip with his first-gen KTM RC 390. This proved to be a good opportunity to compare both bikes. Now, the RC 390 is an out-and-out sports bike with a very committed riding position, so there’s no doubt the RR 310 is more comfortable. But the question here is, by how much? The RR310’s sharp lines aren't exactly designed to hold luggage. Case in point the high and pointy tail section and a tall fuel tank that makes mounting a saddle bag or tank bag difficult. However, touring luggage makers have now started adapting to these types of bikes as well and one such example is the Rynox tail bag that gets eight mounting points. This, coupled with the RR 310’s indentations for bungee hooks on the pillion footpeg mounts and cutouts on the number plate for bungee ropes, help ensure a secure fit. The tail bag sits quite high. But surprisingly, it did not affect handling as much as I thought it would. With the bag firmly in place, the seating is comfortable but was a little snug with my backpack on. This kind of worked though, as we realised that sitting forward on the seat turned out to be more comfortable in the long run. Vibrations must be a pain? Surprisingly they were not. The vibes, though ever present, were not bothersome even with the engine at its peak rev range where the bike sits between 90-100kmph. However, we’re not sure if the damped vibrations were due to the secured tail pack. In comparison, the KTM 390 Duke feels buzzy but is a lot more refined than the Apache. What gets your goat is the gruff nature of the Apache RR 310. The loud and harsh engine sound can get irritable after a couple of hours of riding at speed. Is it a mile muncher? The motor surely is. It goes quickly from 80kmph to 120kmph, provided you shift down to fifth gear. This makes overtaking slow motorists as easy as opening the throttle a little bit. Compared to something like the RC 390, which has extra performance on tap, you’ll find yourself downshifting more often to keep up. That said, the RR 310 runs a lot cooler than the RC 390. It barely had the fan start up even after spending an afternoon riding in the coastal city of Calangute. And when it does, the heat is directed downwards and away from your legs. The RR offers better range as well. On the ride, it gave us a range between 320km and 350km and returned a fuel efficiency of around 32kmpl. Despite this, we stopped often for fuel due to the KTM’s limited range. In fact, every time we stopped to refuel, the RR 310 had over 100 kilometres of range left. You also appreciate the way the RR 310 tackles the 100+ kilometers of B-roads between Nippani and Sawantwadi. You can take on broken roads at speed on the Apache without any of the undulations affecting your wrists or back. It stays planted over mid-corner bumps as well. The RC, on the other hand, feels like a bucking bronco and that can be scary if you encounter rough patches mid-corner. In long distance runs like this, the RC feels like a torture device. In comparison, riding the RR 310 feels as relaxing as a spa session. Its upright seating position and wider seat makes it comfortable enough to endure long journeys. Our return from Goa was delayed, which meant half of our journey had to be completed after nightfall. The RR 310 aces the RC 390’s twin projector setup by having a similar setup but with LED lighting. The result is a much brighter and whiter illumination. The RR 310’s spaced out headlamp placement gives it a wider spread of beam as well. That said, both bikes were capable enough to be ridden at night at close to triple digit speeds. 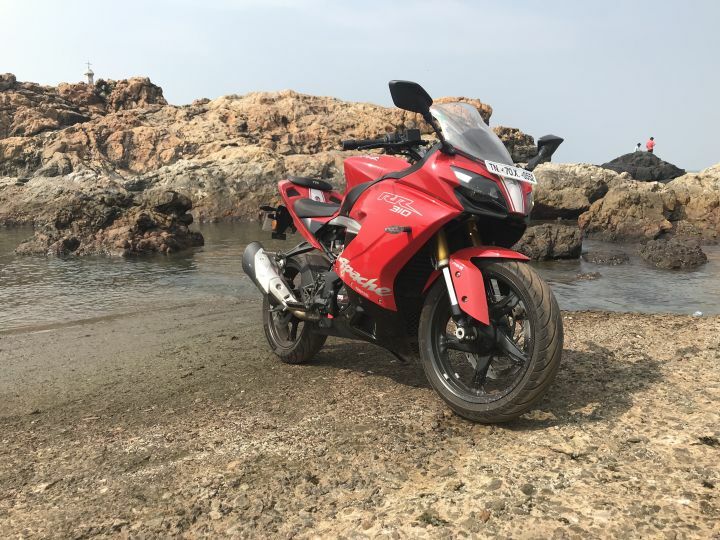 It also makes you marvel at the way both the KTM RC 390 and TVS Apache RR 310 gobble up long distances within a short timespan, irrespective of the time of day. Ultimately, when it comes to taking road trips, it’s the Apache RR 310’s keys we’ll reach out for first.